Neither of my entries are completed, but I am really happy with how this army is shaping up. I think it will be a really interesting force on the tabletop. 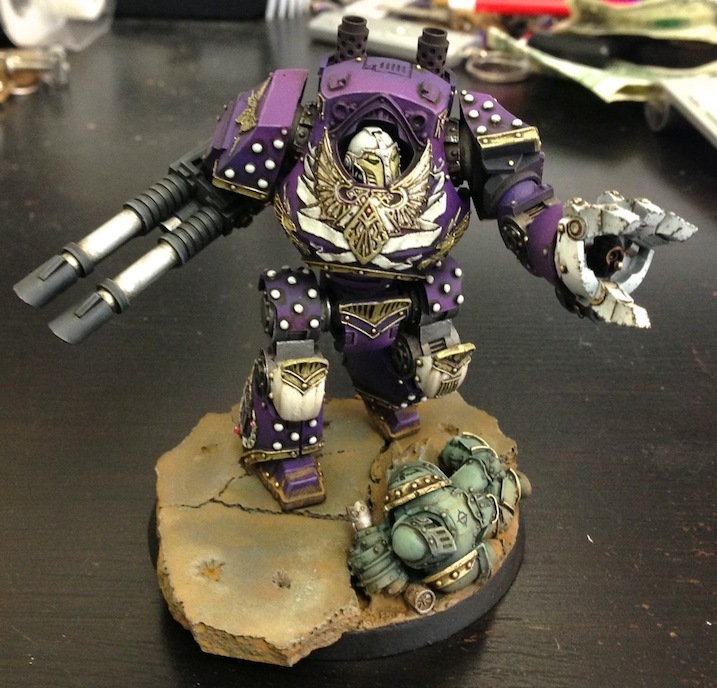 The grayish stone and dead sons of horus marines complement purple really well. When I paint my living Sons of Horus, I'll make sure that the heroes have vibrant red cloaks and details. That should tie the armies together. I am not sure how much painting is left in me tonight. 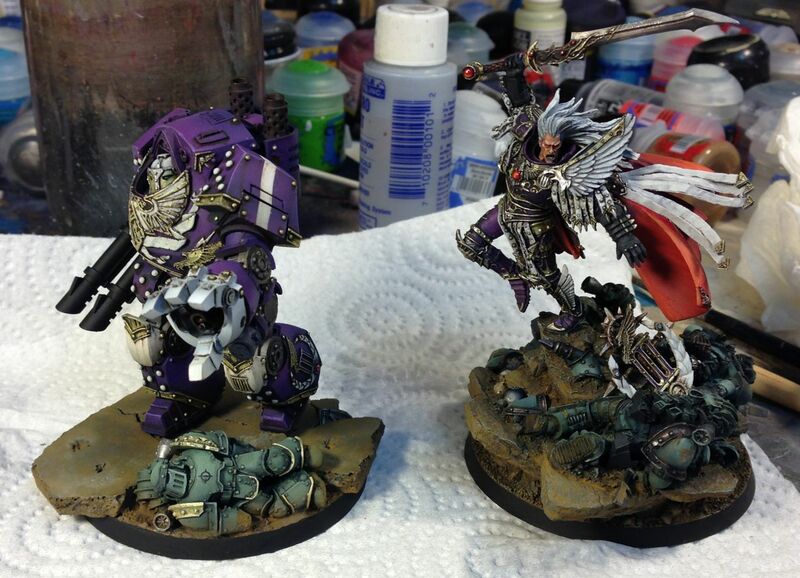 It is rather funny that even though I pulled out of the 40k GT, that I am still rushing to finish miniatures. 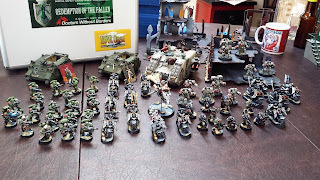 Tomorrow I will have to figure out a 2k marine list for the Narrative event as well. I wanted my EC Contemptor Dreadnought to be wading forward under a volley of fire across the ruined cityscape of Istavaan III. 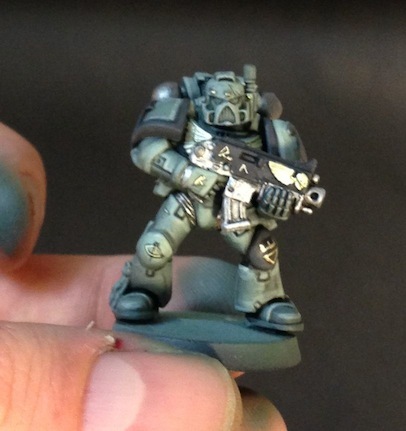 With all the purple on the dreadnought, I needed to work in a Sons of Horus marine in pale green. I wanted this to look like he was killed facing the same front as the honorable dreadnought. I like to think that the weight of the marine's body broke the cement as he was flung backwards. 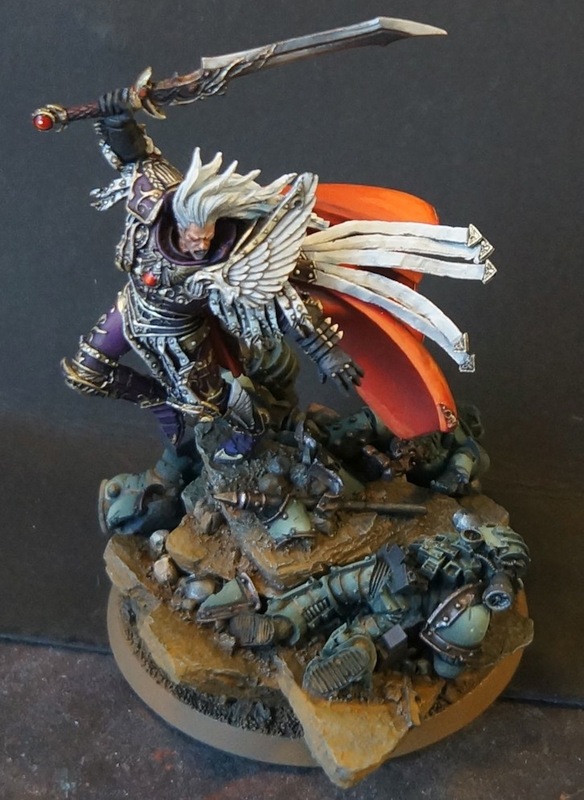 I imagine these guys fighting on, honoring their oaths to the emperor, but feeling the crushing betrayal of their Primarch fathers and legion brothers. 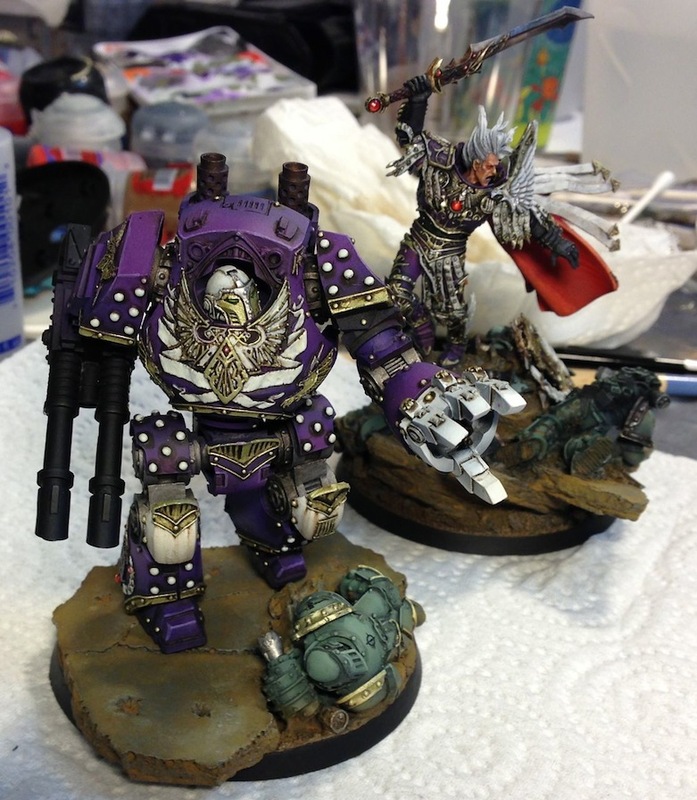 I am really getting into the story behind these purple and green loyalists. 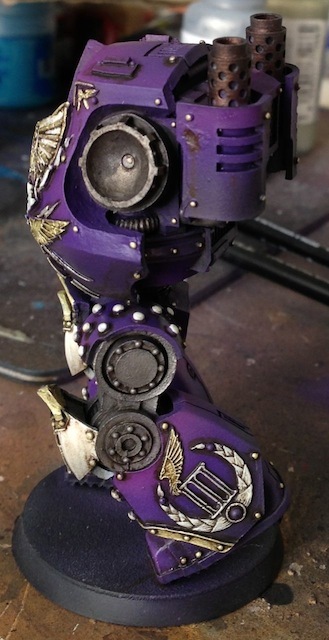 I think there are a host of modeling opportunities of the loyal remnants helping each other out. I am already planning a mini joint command squad. I think an EC medic helping a SoH veteran would look really cool. So. Is the base too bland, or does it complement the vastly too detailed dread? I thought I should show you some updates with dull coat on the mini. It helps dramatically! 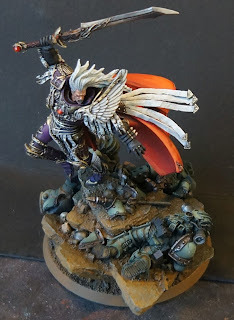 There are areas where I missed the opportunity to remove some of the oil wash with thinner, but since this model represents a loyalist, I think the damage and stains will just add more character. 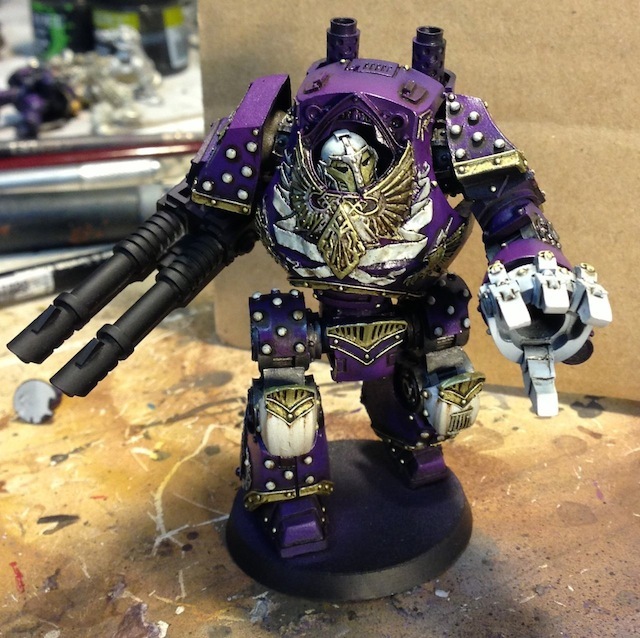 I wanted another entry for the NOVA OPEN painting competition, so I started working on a loyalist EC dreadnought. 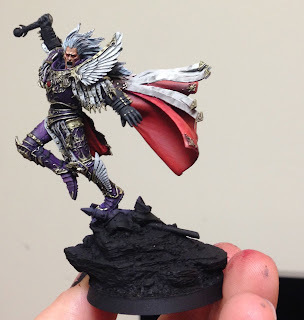 The model is glossy right now to make the oil wash flow better. Recently I've been experimenting with historical model painting techniques, and oil washes are one of my favorite finds. Tomorrow when the washes are dry, I'll dull coat the miniature and do the final blends and chipping. The arm segments are magnetized so the shoulders and elbows can be reposed. 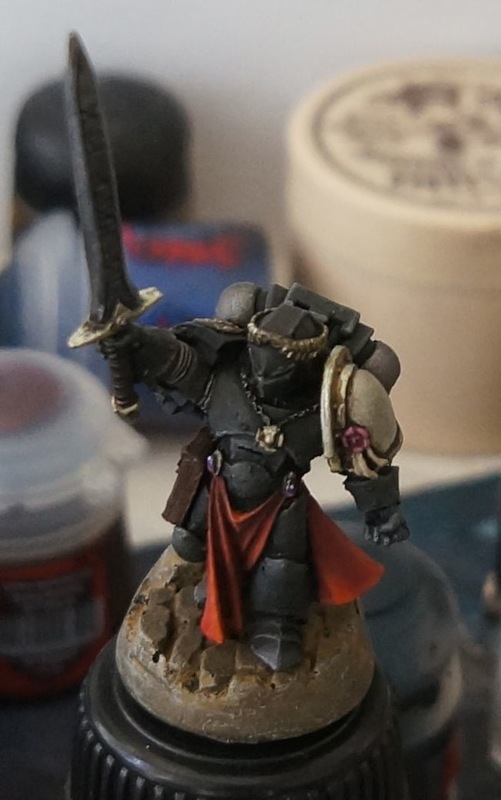 His head is loose, but I wanted a glimpse of the final model. It really is nice to be finally painting this FW stuff I've been hoarding. 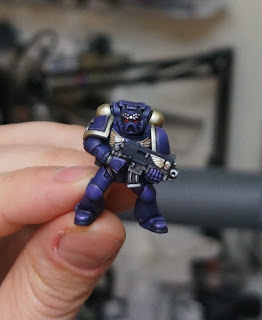 Rather than force myself to paint troops first, I decided I would just paint the cool stuff first. There is a lot of work to go no this guy, but I think I can get him ready by Friday. I painted the III legion standard this morning to see how it would look on the base, but the closer I got to finishing it the less I liked it. My inclination now is to remove it from the base, since it draws attention away from Fulgrim himself. The other issue is that the casting of the standard is poor. Weathering powders could make it look realistically damaged. What do you think? Should I just remove the legion standard? 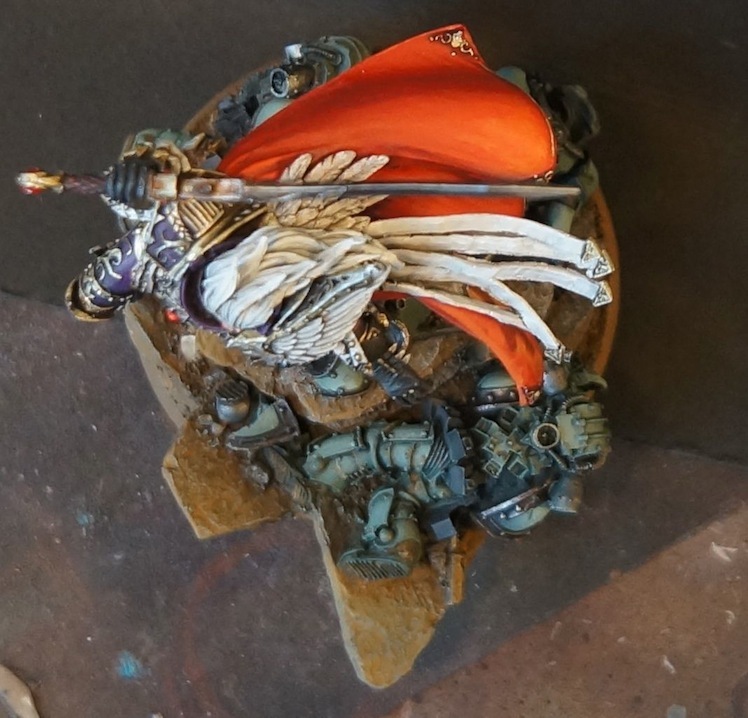 I could always add it to an actual standard bearer. 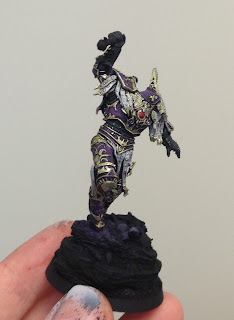 I've already decided not to paint up Fulgrim's gun because it looks cumbersome, but it feels weird to be editing off parts of a forge world model. Maybe I have too much forge world respect. The last thing to do for this model is select a rim color for the base. It was suggested that I go with a darker brown, which I think makes sense. My first choice of black, may distract too much. I have a painting marathon head of me this weekend. I need to paint more Ultramarine troops for the NOVA narrative campaign, as well as complete a few more entries to the crystal brush. I pushed through the day and now have the beginnings of a base for Fulgrim! 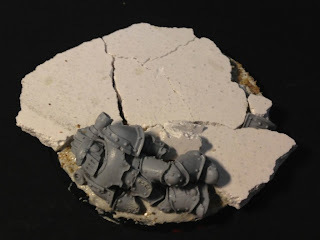 Tomorrow morning I will seal the base and put Sons of Horus transfers on the dead marines. 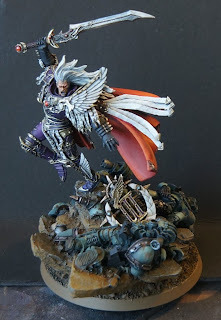 After that comes chipping, and then weathering powders. 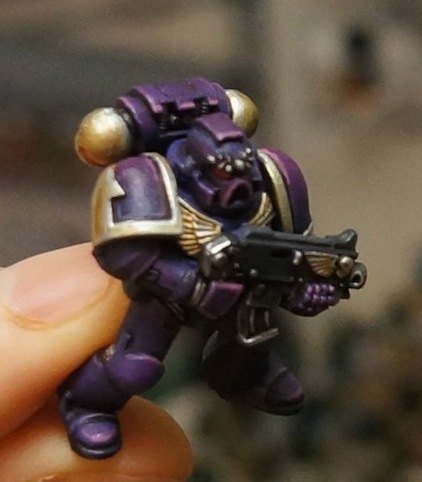 I was thinking of adding grime streaks to the marines to make it clear that they were on Istavan III during the world eater virus, but that might be too much. I really can't wait to paint up some live SoH troops now that I have recipe I like. The photos with the unpainted base are truer to color than the ones I took tonight. The hazards of painting all day. What do you think? 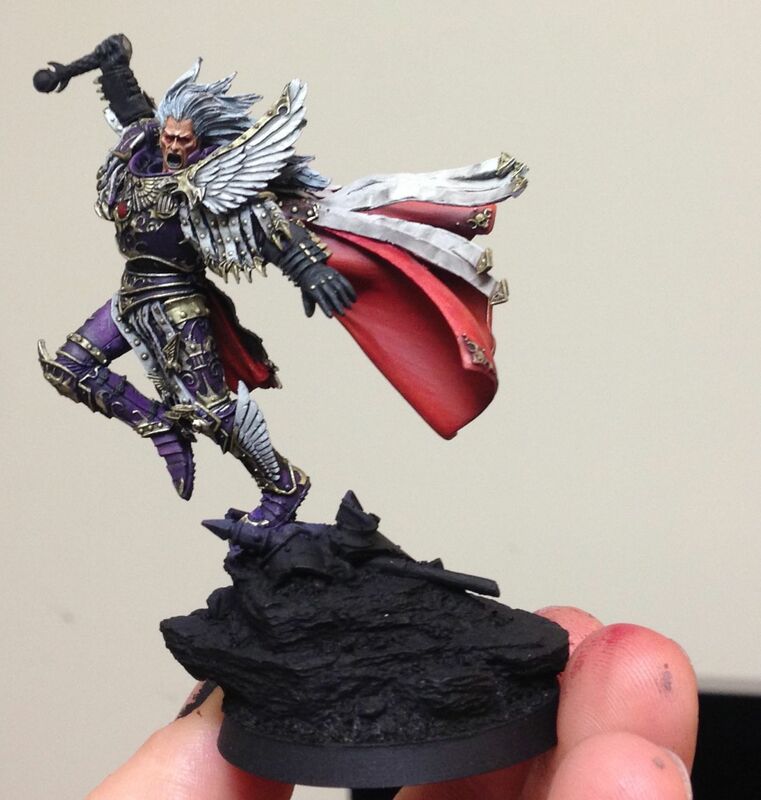 Could this mini be entered into the NOVA crystal brush? I see lots of imperfections personally, but I just really love the model and how it is turning out. What do you think? 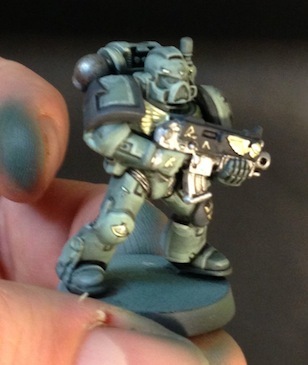 I knocked out a quick color test marine for a Sons of Horus loyalist. While Imperial fists would add a great dash of yellow, I really want this mini diorama to be set during Istavan III, when the traitor legions betrayed their fellow brothers and slaughtered them. Hence the green test mini. Fulgrim required three test minis before I had my purple recipe. I think this guy is pretty close already. I am tempted to add a bit more blue. So a World Eater, a Sons of Horus, and Death Guard marine walk into a bar.... I was thinking about using those legions on the base, but I am worried the base would be too colorful. 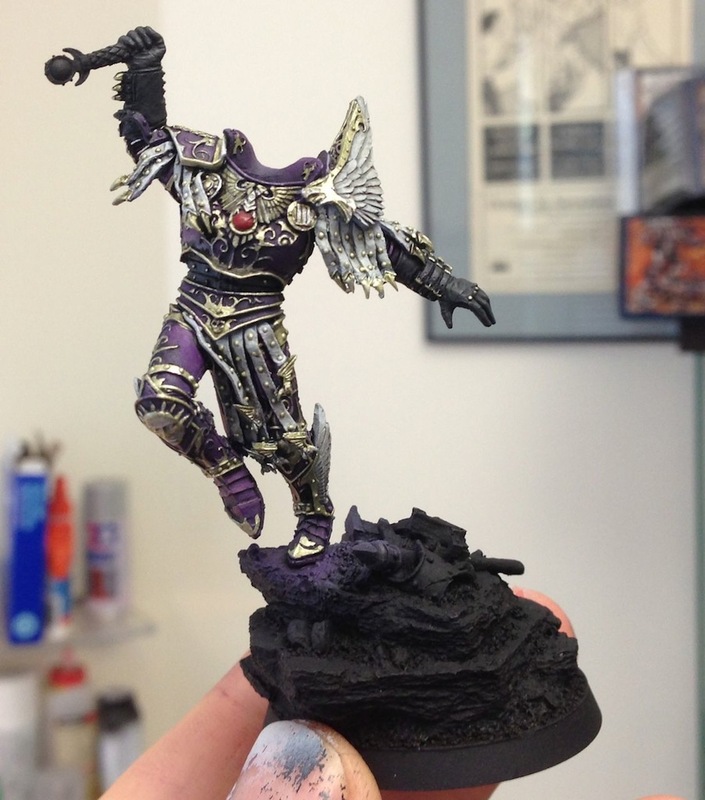 The alternative is just painting all three of them in SoH colors, and letting the dust tie them into the base. That would keep the focus on the third legions Primarch. 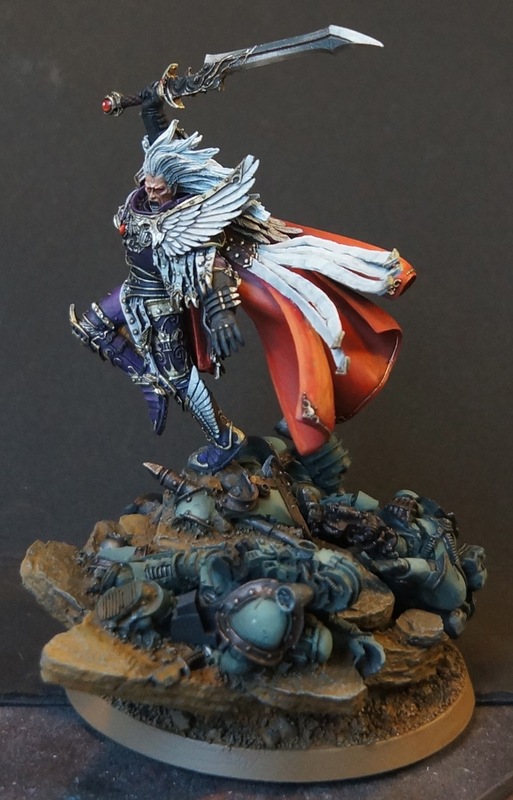 The three distinct color schemes for Dark Angels provide a lot of visual interest across units. There are some stand out models in this force. If you have not seen it, then you should check out Mike Cho's Grand Master. 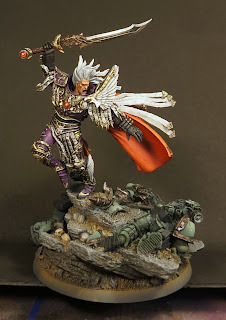 His work is stunning. While I used an airbrush to paint the power swords, he blended his by hand. He even did it faster! The rhino's deserve just praise. The freehand is incredible. 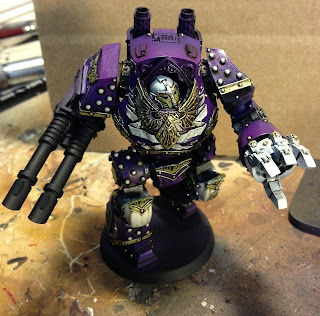 I would never run them as razorbacks if I had freehand designs like that. As primarily an army painter, and not a gamer, It never gets too far from my mind that many people view the models as just tools to play the game. I see models as the ends and not the means. 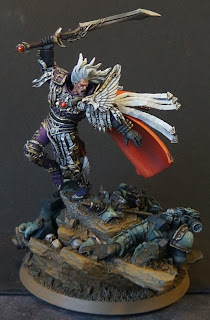 Mike Brandt referred to the painters of the charity army as artists. I had never considered what I do as anything other than hobby, other than a series of techniques that achieve repeatable results. If you want to paint in bulk, it becomes very procedural. I like thinking of my painting as art. 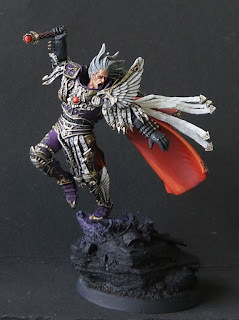 I think everyone who paints a miniature should consider it art. Now, since our art is now in the wild. 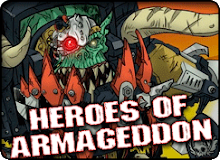 Does anyone have photos of the devil dogs from Heroes of Armageddon, or the LR from Storm Wardens? I would love to see those models on gaming tables blasting the crap out of other units. After a pleasant day dropping the Redemption of the Fallen miniatures off at Brandt's place, I decided I needed to break the ice on one of the more intimidating project's I've been putting off. So far I've spent half the day painting, and all I've managed to do is give myself a nightmare amount of cleanup work around the gold filigree. 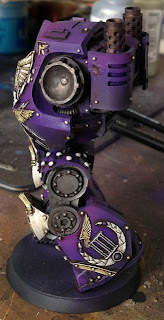 The model is wonderful, and I think it will look great as part of the force, but the metal filigree is just too small. That said, I am happy to have started something challenging. 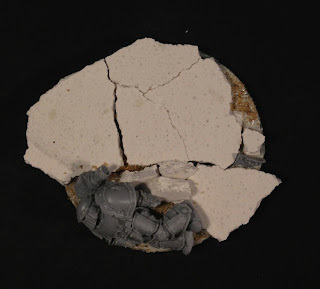 I plan to surround the base with Sons of Horus wounded, since light green would go really well with the purple. 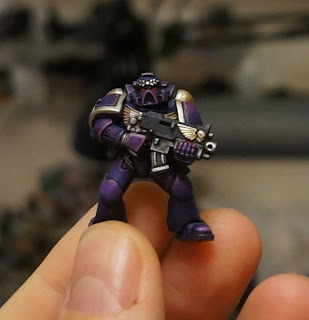 Using the same miniature from the last post, I decided to try out adding pink. This is a test mini after all, and is destined for a bath in simple green before too long, so why not try out everything. 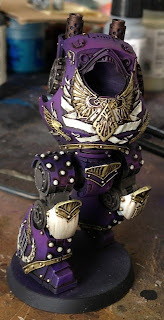 I created a glaze out of GW screamer pink and spread it around really carefully around the armor plates. I tried to make the paint act like a tint rather than a full blown layer. The previously highlighted purple stayed light, and the darker purple turned a bit more red. 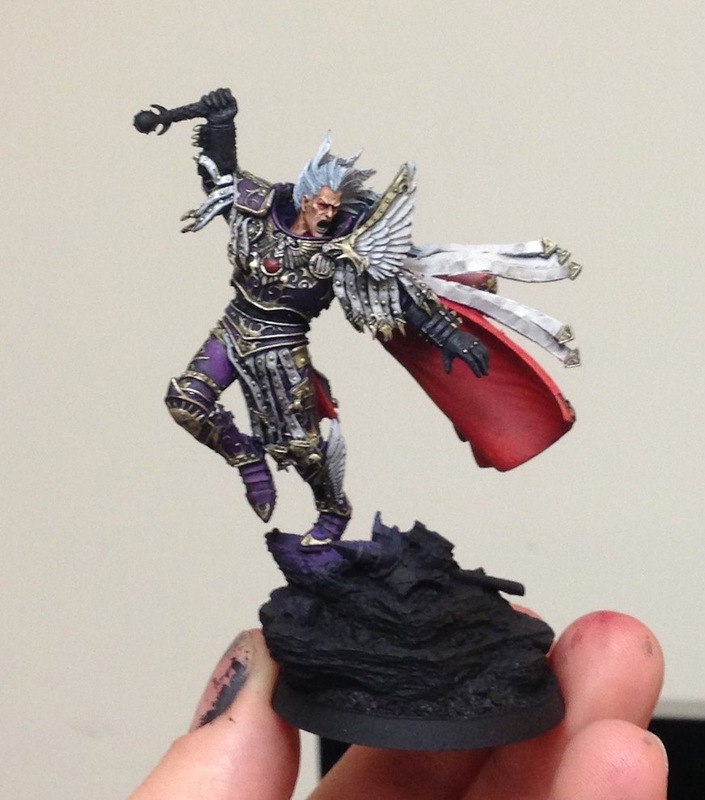 I finished the model off by adding some line highlights of EC pink. While some of the previous blending was lost, overall the tinting process seems to work. 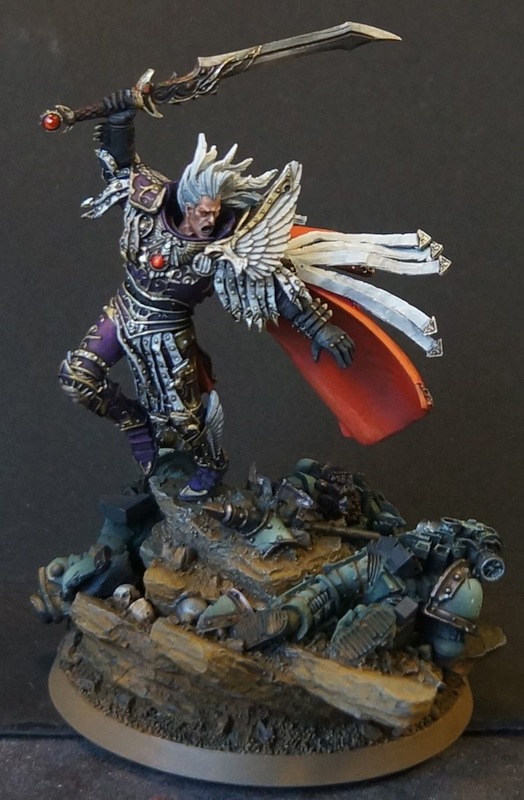 I am not sure I could control this on a whole army's worth of models, but I like this version of the EC better. Imagine rich red cloaks on all of the special characters. I think the tint warms up the base enough so it would look good. How does this version compare to the last? I painted two test miniatures to practice purple for my upcoming EC army. Only one of them is shown here. The other looks bizarre at the moment. 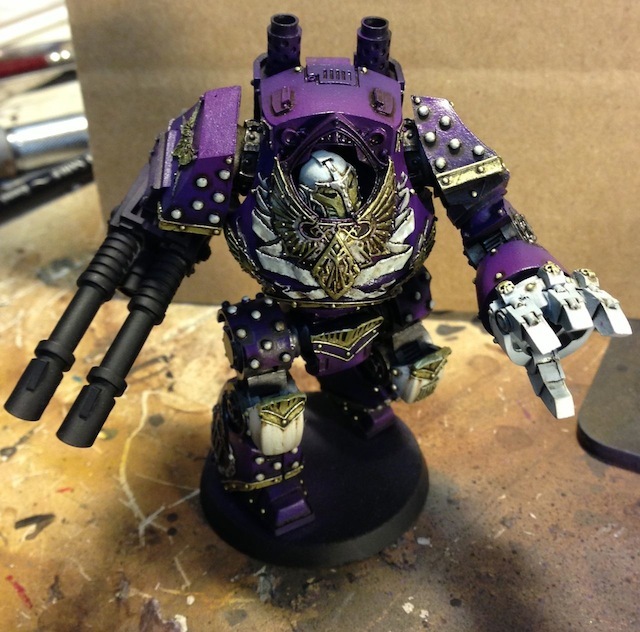 On this mini I used all VGC paints. 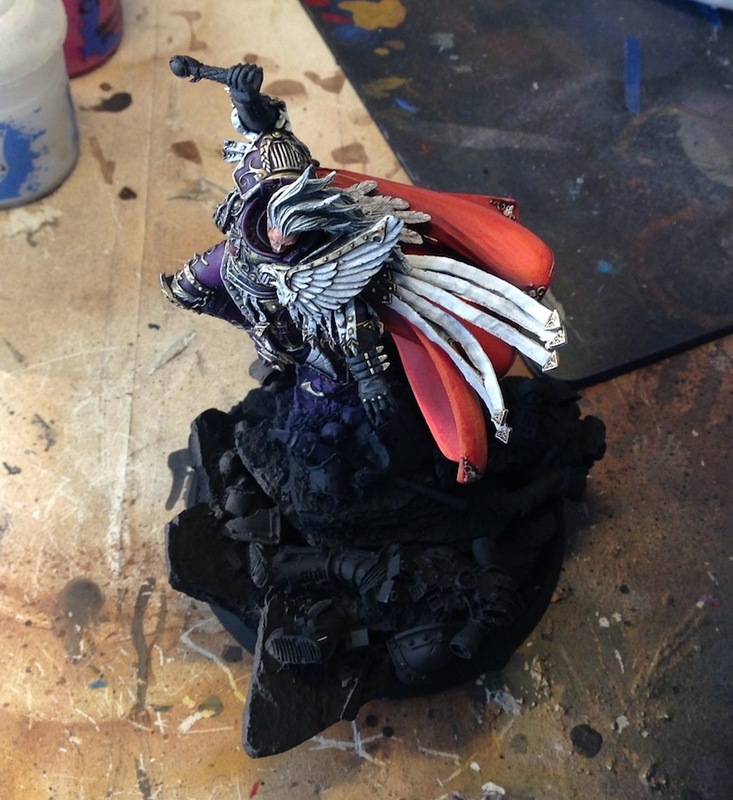 I am considering removing the gryphon sepia wash from the gold, and going with a more silver tone. 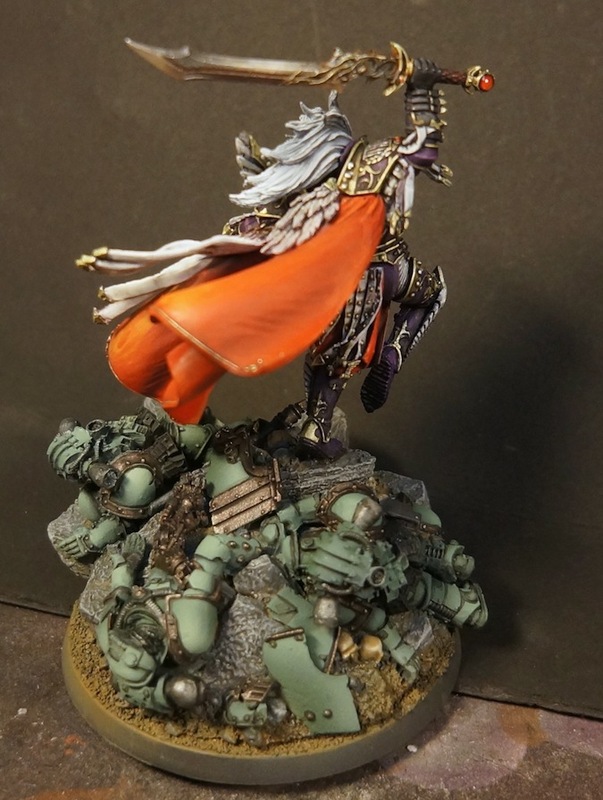 NMM gold may have to come into play, though that will seriously reduce my productivity. 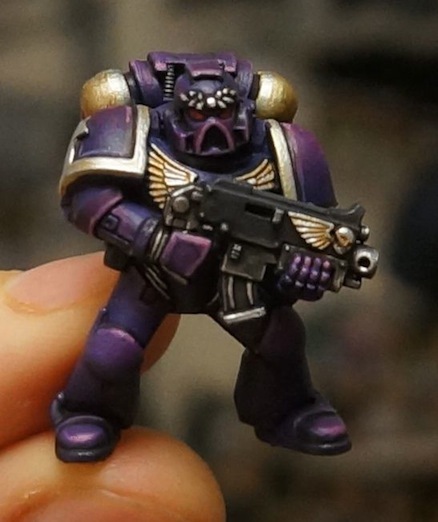 So, should Emperor's children be purple, or should they be pink/purple. My next test mini will go with a more pink reddish purple. 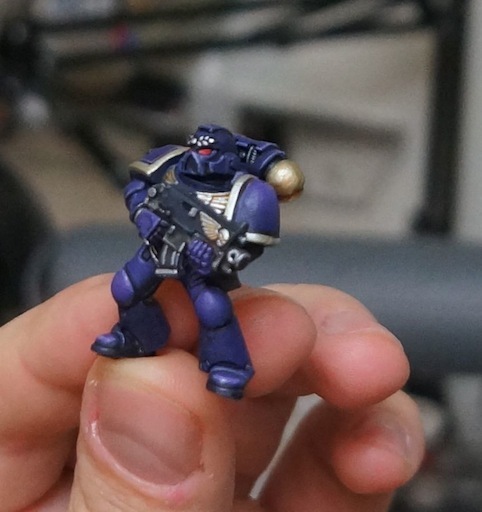 I had planned to take some shots of two more alternate emperor's children test marines, but a package from micromark arrived and stole my attention away. 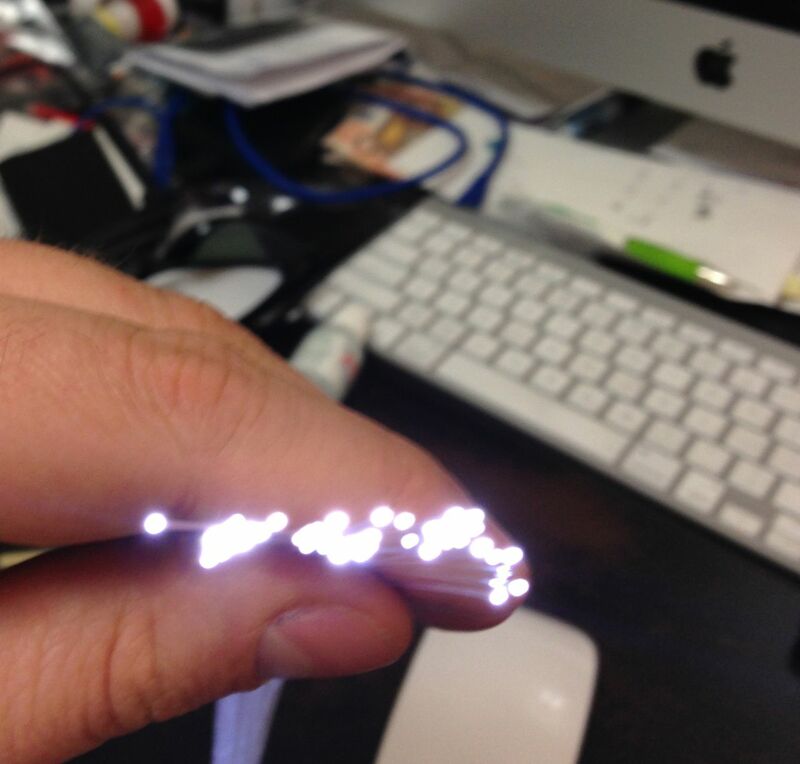 I bought these fiber optics on a lark, and now I don't know what to do with them. My original idea included using these as runway lights for next year's armies on parade, but there are so many uses. 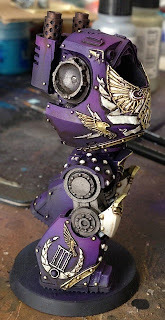 Perhaps they could end up in a land raider, or inside some tau aircraft. My top choice is to use them on the display base as part of a runway/landing pad. What would you use these lights for? Black can be a difficult color to paint. Usually I paint it using a very dark grey, tinted brown for warm or blue for cold. 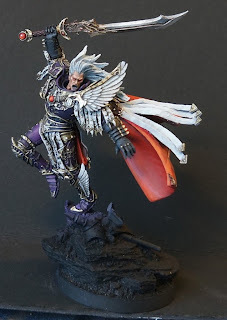 I also almost always use an airbrush to paint black miniatures. 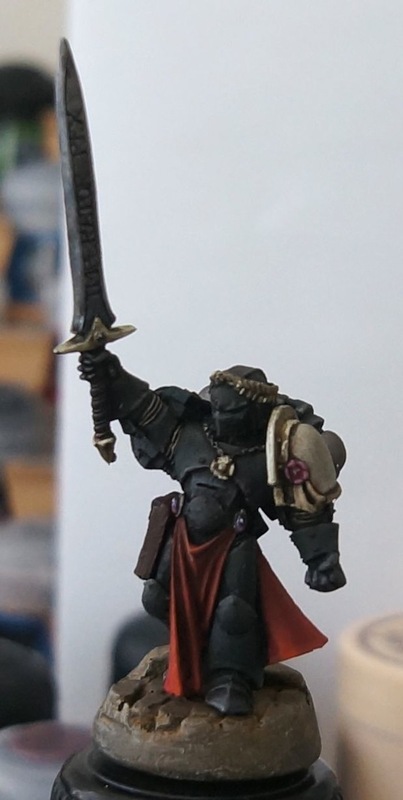 Last night I tried painting a black miniature making heavy use of Latham Medium. 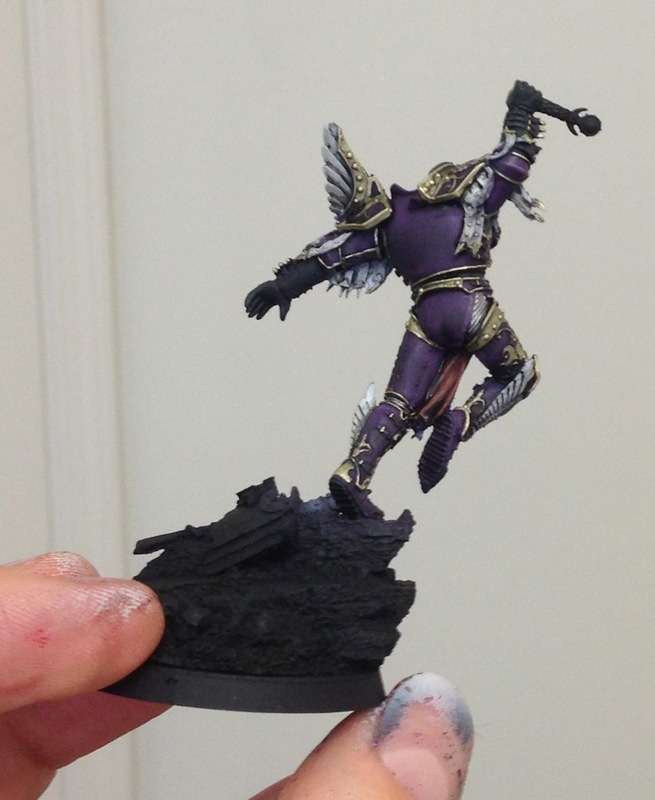 Instead of wet blending, I used very thin layers. At the very end of base coating, I doused the mini in gloss varnish, and used oil washes selectively. I used a dark brown around the armor plates, and streaking grim on all of the gold areas. I then waited till the oil had become tacky (thanks to a hair dryer it only took a few minutes) and used a clean brush with a tiny dab of white spirit to clean off the portions of the wash I did not like. I was not happy with the miniature last night, but this morning I can see some promise. Unfortunately this finecast model has terrible surface quality and loss of detail, so it is not worth repainting. The right shoulder pad was pitted so badly that after painting, I had to use a heavy dose of gloss varnish to fill in the the imperfections. I think that worked better than green stuff, so I'll use the method again. The base just happened to be a reject I had nearby. I will use dusty desert bases so these guys could ally with my tallarn. Also it would allow me to put weathering powder on their feet, which will probably look pretty cool.